Role played by the DLK proteins (DLK1 and DLK2) and Notch in adipocyte and hematopoietic differentiation, and on cell growth and oncogenic transformation.1.a. Study of interactions of EGF-like proteins DLK1 And DLK2 with the Notch/Notch ligand system and its role in adipogenesis.1.b. 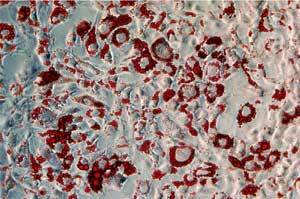 Involvement of NOTCH receptors and DLK proteins in cell proliferation and tumor processes.1.c. Study of the regulation of expression of the DLK protein. Molecular mechanisms controlling the activation of macrophages and the development of the inflammatory response.2.a. Role played by Notch protein in the activation of macrophages and on the inflammatory response.2.b. Role of adenosine and A2 receptors in the alternative macrophage activation and resolution of inflammation. Study of ROR1 as a resistin receptor implicated in adipogenesis and insulin resistance. Genetic and epigenetic studies of imprinting (preferential expression of the maternal or paternal allele): its origin and implications of the loss of imprinting in cancer and disease. García-Cano J, Ambroise G, Pascual-Serra R, Carrión MC, Serrano-Oviedo L, Ortega-Muelas M, Cimas FJ, Sabater S, Ruiz-Hidalgo MJ, Sanchez Perez I, Mas A, Jalón FA, Vazquez A, Sánchez-Prieto R. Exploiting the potential of autophagy in cisplatin therapy: A new strategy to overcome resistance. Oncotarget. 2015 Jun 20;6(17):15551-65. (A). García-Gallastegui P, Ibarretxe G, Garcia-Ramírez JJ, Baladrón V, Aurrekoetxea M, Nueda ML, Naranjo AI, Santaolalla F, Sánchez-del Rey A, Laborda J, Unda F. DLK1 regulates branching morphogenesis and parasympathetic innervation of salivary glands through inhibition of NOTCH signalling. Biol Cell. 2014 Aug;106(8):237-53. doi: 10.1111/boc.201300086. (A). Nueda ML, Naranjo AI, Baladrón V, Laborda J. The proteins DLK1 and DLK2 modulate NOTCH1-dependent proliferation and oncogenic potential of human SK-MEL-2 melanoma cells. Biochim Biophys Acta. 2014 Nov;1843(11):2674-84. doi: 10.1016/j.bbamcr.2014.07.015. (A). Müller D, Cherukuri P, Henningfeld K, Poh CH, Wittler L, Grote P, Schlüter O, Schmidt J, Laborda J, Bauer SR, Brownstone RM, Marquardt T. Dlk1 Promotes a Fast Motor Neuron Biophysical Signature Required for Peak Force Execution. Science. 2014. 343(6176): 1264-1266. (A). Monsalve EM, García-Gutiérrez MS, Navarrete F, Giner S, Laborda J, Manzanares J. Abnormal Expression Pattern of Notch Receptors, Ligands, and Downstream Effectors in the Dorsolateral Prefrontal Cortex and Amygdala of Suicidal Victims. Mol Neurobiol. 2014;49(2):957-65. doi: 10.1007/s12035-013-8570-z. [Epub 2013]. (A). Andersen DC, Laborda J, Baladron V, Kassem M, Sheikh SP, Jensen CH. Dual role of delta-like 1 homolog (DLK1) in skeletal muscle development and adult muscle regeneration. Development. 2013;140(18):3743-53. (A). Mirshekar-Syahkal B, Haak E, Kimber GM, van Leusden K, Harvey K, O’ Rourke J, Laborda J, Bauer SR, de Bruijn MF, Ferguson-Smith AC, Dzierzak E, Ottersbach K. Dlk1 is a negative regulator of emerging hematopoietic stem and progenitor cells. Haematologica. 2013; 98(2):163-71. [Epub 2012]. (A). Mortensen SB, Jensen CH, Schneider M, Thomassen M, Kruse TA, Laborda J, Sheikh SP, Andersen DC. Membrane-tethered delta-like 1 homolog (DLK1) restricts adipose tissue size by inhibiting preadipocyte proliferation. Diabetes. 2012;61(11):2814-22. (A). de la Casa-Esperon E. Horizontal transfer and the evolution of host-pathogen interactions. Int J Evol Biol. 2012; 2012: 679045. (A). Calaway JD, Domínguez JI, Hanson ME, Cambranis EC, Pardo-Manuel de Villena F, de la Casa-Esperon E. Intronic Parent-of-Origin Dependent Differential Methylation at the Actn1 Gene Is Conserved in Rodents but Is Not Associated with Imprinted Expression. PLoS One. 2012. 7: e48936. (A). Casa-Esperón E. Nonmammalian Parent-of-Origin Effects. Methods Mol Biol. 2012. 925: 277-294. (A). Casa-Esperón E, Cordier G, Engel N. A genomic reservoir for Tnfrsf genes is developmentally regulated and imprinted in the mouse. Epigenetics. 2012. 7: 1-13. (A). Rivero S, Díaz-Guerra MJ, Monsalve EM, Laborda J, García-Ramírez JJ. DLK2 is a transcriptional target of KLF4 in the early stages of adipogenesis. J Mol Biol. 2012. 417[1-2]: 36-50. (A). Sánchez-Solana B, Laborda J, Baladrón V. Mouse Resistin Modulates Adipogenesis and Glucose Uptake in 3T3-L1 Preadipocytes Through the ROR1 Receptor. Mol Endocrinol. 2012. 26: 110-127. [Epub 2011]. (A). Rivero S, Ruiz-García A, Díaz-Guerra MJ, Laborda J, García-Ramírez JJ. Characterization of a proximal Sp1 response element in the mouse Dlk2 gene promoter. BMC Mol Biol. 2011. 12: 52. (A). de la Casa-Esperón E. From mammals to viruses: the Schlafen genes in developmental, proliferative and immune processes. BioMolecular Concepts. 2011. 2: 159-169. (A). Puertas-Avendaño RA, González-Gómez MJ, Ruvira MD, Ruiz-Hidalgo MJ, Morales-Delgado N, Laborda J, Díaz C, Bello AR. Role of the non-canonical Notch ligand DLK1 in hormone-producing cells of the adult male mouse pituitary. J Neuroendocrinol. 2011. 23: 849-859. (A). Ruiz-Garcia A, Monsalve E, Novellasdemunt L, Navarro-Sabate A, Manzano A, Rivero S, Castrillo A, Casado M, Laborda J, Bartrons R, Diaz-Guerra MJ. Cooperation of adenosine with macrophage Toll-4 receptor agonists leads to increased glycolytic flux through the enhanced expression of 6-Phosphofructo-2-kinase/fructose-2,6-bisphosphatase 3 (PFKFB3). J Biol Chem. 2011. 286: 19247-19258. (A). Lacaze P, Forster T, Ross A, Kerr LE, Salvo-Chirnside E, Lisnic VJ, López-Campos GH, García-Ramírez JJ, Messerle M, Trgovcich J, Angulo Aguado A, Ghazal P. Temporal profiling of the coding and non-coding murine cytomegalovirus transcriptomes. J Virol. 2011. 85: 6065-6076. (A). Wallace M, Vlangos CN, de la Casa-Esperon E. The 24th International Mammalian Genome Conference meeting report. Mamm Genome. 2011. 22[3-4]: 148-155. (A). Abdallah BM, Ditzel N, Mahmood A, Isa A, Traustadottir GA, Schilling AF, Ruiz-Hidalgo M, Laborda J, Amling M, Kassem M. DLK1 is a novel regulator of bone mass that mediates estrogen-deficiency induced bone loss in mice. J Bone Miner Res. 2011. 26: 1457-1471. (A). Sánchez-Solana B, Nueda ML, Ruvira MD, Ruiz-Hidalgo MJ, Monsalve EM, Rivero S, García-Ramírez JJ, Díaz-Guerra MJ, Baladrón V, Laborda J. The EGF-like proteins DLK1 and DLK2 function as inhibitory non-canonical ligands of NOTCH1 receptor that modulates each other’s activities. Biochim Biophys Acta. 2011. 1813: 1153-1164. (A). Monsalve E, Ruiz-García A, Baladrón V, Ruiz-Hidalgo MJ, Sánchez-Solana B, Rivero S, García-Ramírez JJ, Rubio A, Laborda J, Díaz-Guerra MJ. Notch1 upregulates LPS-induced macrophage activation by increasing NF-kappaB activity. Eur J Immunol. 2009. 39: 2556-2570. (A). Hermida C, Garcés C, de Oya M, Cano B, Martínez-Costa OH, Rivero S, García-Ramírez JJ, Laborda J, Aragón JJ. The serum levels of the EGF-like homeotic protein dlk1 correlate with different metabolic parameters in two hormonally different children populations in Spain. Clin Endocrinol (Oxf). 2008. 69: 216-224. (A). Bingham A, Mamyrova G, Rother KI, Oral E, Cochran E, Premkumar A, Kleiner D, James-Newton L, Targoff IN, Pandey JP, Carrick DM, Sebring N, O’Hanlon TP, Ruiz-Hidalgo M, Turner M, Gordon LB, Laborda J, Bauer SR, Blackshear PJ, Imundo L, Miller FW, Rider LG. Predictors of acquired lipodystrophy in juvenile-onset dermatomyositis and a gradient of severity. Medicine (Baltimore). 2008. 87: 70-86. (A). Raghunandan R, Ruiz-Hidalgo M, Jia Y, Ettinger R, Rudikoff E, Riggins P, Farnsworth R, Tesfaye A, Laborda J, Bauer SR.. Dlk1 influences differentiation and function of B lymphocytes. Stem Cells Dev. 2008. 17: 495-507. (A). Nueda ML, García-Ramírez JJ, Laborda J, Baladrón V. dlk1 specifically interacts with insulin-like growth factor binding protein 1 to modulate adipogenesis of 3T3-L1 cells. J Mol Biol. 2008. 379: 428-442. (A). Nueda ML, Baladron V, Garcia-Ramirez JJ, Sanchez-Solana B, Ruvira MD, Rivero S, Ballesteros MA, Monsalve EM, Diaz-Guerra MJ, Ruiz-Hidalgo MJ, Laborda J. The novel gene EGFL9/Dlk2, highly homologous to Dlk1, functions as a modulator of adipogenesis. J Mol Biol. 2007. 367: 1270-1280. [Epub 2006]. (A). Nueda ML, Baladron V, Sanchez-Solana B, Ballesteros MA, Laborda J. The EGF-like protein dlk1 inhibits notch signaling and potentiates adipogenesis of mesenchymal cells. J Mol Biol. 2007. 367: 1281-1293. [Epub 2006]. (A). Abdallah BM, Boissy P, Tan Q, Dahlgaard J, Traustadottir GA, Kupisiewicz K, Laborda J, Delaisse JM, Kassem M. DLK1/FA1 regulates the function of human bone marrow mesenchymal stem cells (HMSC) by modulating gene expression of pro-inflammatory cytokines and immune-response-related factors. J Biol Chem. 2007. 282: 7339-7351. [Epub 2006]. (A). Notari L, Baladron V, Aroca-Aguilar JD, Balko N, Heredia R, Meyer C, Notario PM, Saravanamuthu S, Nueda ML, Sanchez-Sanchez F, Escribano J, Laborda J, Becerra SP. Identification of a lipase-linked cell membrane receptor for pigment epithelium-derived factor. J Biol Chem. 2006. 281: 38022-38037. (A). Monsalve E, Perez MA, Rubio A, Ruiz-Hidalgo MJ, Baladron V, Garcia-Ramirez JJ, Gomez JC, Laborda J, Diaz-Guerra MJ. Notch-1 up-regulation and signaling following macrophage activation modulates gene expression patterns known to affect antigen-presenting capacity and cytotoxic activity. J Immunol. 2006. 176: 5362-5373. (A). Li D, Yea S, Li S, Chen Z, Narla G, Banck M, Laborda J, Tan S, Friedman JM, Friedman SL, Walsh MJ. Kruppel-like factor-6 promotes preadipocyte differentiation through histone deacetylase 3-dependent repression of DLK1.J Biol Chem. 2005. 280: 26941-26952. (A). Baladron V, Ruiz-Hidalgo MJ, Nueda ML, Diaz-Guerra MJ, Garcia-Ramirez JJ, Bonvini E, Gubina E, Laborda J. dlk acts as a negative regulator of Notch1 activation through interactions with specific EGF-like repeats. Exp Cell Res. 2005. 303: 343-359. [Epub 2004]. (A). Ebrahimi B, Dutia BM, Roberts KL, Garcia-Ramirez JJ, Dickinson P, Stewart JP, Ghazal P, Roy DJ, Nash AA. Transcriptome profile of murine gammaherpesvirus-68 lytic infection. J Gen Virol. 2003. 84[Pt 1]: 99-109. (A). Landete-Castillejos T, Garcia A, Gomez JA, Laborda J, Gallego L. Effects of nutritional stress during lactation on immunity costs and indices of future reproduction in Iberian red deer (Cervus elaphus hispanicus). Biol Reprod. 2002. 67: 1613-1620. (A). Baladron V, Ufano S, Duenas E, Martin-Cuadrado AB, del Rey F, Vazquez de Aldana CR. Eng1p, an endo-1,3-beta-glucanase localized at the daughter side of the septum, is involved in cell separation in Saccharomyces cerevisiae. Eukaryot Cell. 2002. 1: 774-786. (A). Baladron V, Ruiz-Hidalgo MJ, Bonvini E, Gubina E, Notario V, Laborda J. The EGF-like homeotic protein dlk affects cell growth and interacts with growth-modulating molecules in the yeast two-hybrid system. Biochem Biophys Res Commun. 2002. 291: 193-204. (A). Ruiz-Hidalgo MJ, Gubina E, Tull L, Baladron V, Laborda J. dlk modulates mitogen-activated protein kinase signaling to allow or prevent differentiation. Exp Cell Res. 2002. 274: 178-188. (A). Callejas NA, Casado M, Diaz-Guerra MJM, Bosca L, Martin-Sanz P.. Expression of cyclooxygenase-2 promotes the release of matriz metalloproteinase-2 and 9 in fetal rat hepatocytes. Hepatology. 2001. 33: 860-867. (A). Mojena M, Hortelano S, Castrillo A, Diaz-Guerra MJM, Garcia-Barchino MJ, Saez GT, Bosca L.. Protection by nitric oxide against liver inflammatory injury in animals carrying a nitric oxide synthase-2 transgene. FASEB J. 2001. 15: 583-595. (A). Baladron V, Ruiz-Hidalgo MJ, Gubina E, Bonvini E, Laborda J. Specific regions of the extracellular domain of dlk, an EGF-like homeotic protein involved in differentiation, participate in intramolecular interactions. Front Biosci. 2001. 6: 25-32. (A). Laborda J. The role of the epidermal growth factor-like protein dlk in cell differentiation. Histol Histopathol. 2000. 15: 119-129. (A). Escribano J, Diaz-Guerra MJ, Riese HH, Alvarez A, Proenza R, Fernandez JA. The cytolytic effect of a glycoconjugate extracted from corms of saffron plant (Crocus sativus) on human cell lines in culture. Planta Med. 2000. 66: 157-162. (A).